Summer is almost here, but that doesn’t mean you should have to put up with high energy bills. Here in Las Vegas, spending the summer without the air conditioning on is unheard of. It’s just too hot to suffer through the heat without some relief, but some people still try to avoid using their air conditioners as much as possible because they want to avoid the high energy bills that come with having to rely on their air conditioners. If this sounds like you, then you’ll be glad to know that there is another way to save more energy this summer. Check out our last blog to learn a few tips for saving energy this summer, and keep reading to learn more. #5. Use a fan while you’re home. If you want to stay cool without having to rely even more on your air conditioner, try combining your unit’s efforts with a ceiling fan. Ceiling fans are quite effective when it comes to keeping people cool, and they even make it possible to turn your thermostat up a few degrees. However, it’s important to keep in mind that fans only cool people, and they won’t actually lower the temperature in your home, so don’t leave it on when you’re not there to enjoy its effects. #6. Get your old air conditioner replaced. Is your air conditioner more than a few years old? If so, there’s a good chance that it isn’t as efficient as it could be. The fact of the matter is that air conditioning technology has come a long way, and new models tend to be much more efficient than older models. While replacing your air conditioner is certainly a much bigger upfront investment than any of the other tips we’ve gone over, it could help you save energy on a monthly basis. #7. Seal your home against air leaks. Whether the air is leaking into your attic or outside your home, the last thing anyone wants is for the air conditioned air to escape their homes. Air leaks in the ducts, vents and even the windows and doors in your home could be detrimental to your energy saving efforts. But the good news is that sealing those leaks could help you save a sizeable amount on your energy bills every month. #8. Replace your manual thermostat with an automatic one. There’s absolutely no point in running the air conditioner at full blast when you aren’t home, and if you have an old, manual thermostat and you forget to adjust it before you leave the house, you’ll be out of luck. However, if you replace your manual thermostat with an automatic one, you can program your thermostat to automatically adjust when you’re at work or asleep. Some automatic thermostats can even be adjusted remotely using your mobile device, giving you even more control over the temperature in your home. 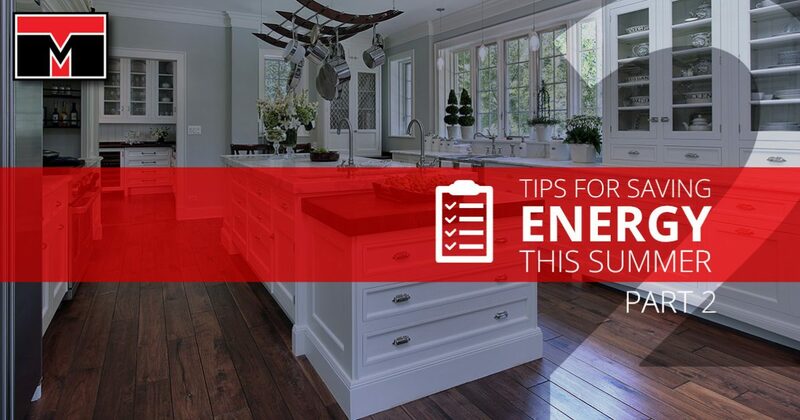 Summer is just a few weeks away, and we hope these tips will help you avoid the high energy bills that summer can bring. If it’s time to replace your air conditioner, or you need HVAC repair or maintenance, call the experts at Tippetts Mechanical today to schedule your free in-home estimate.